My pretty, pretty, pretty amazing partner in life Natalie redefined her limits once again this past weekend by completing the Chicago Marathon. The Chicago Marathon is pretty neat as a participant as you get to not only see quite a few neighborhoods, but you also get encouraged by the spectators across all 26.2 miles of the course. Well...I think that because they're now limiting access to the finish line, it's more like you get encouraged by spectators for like 25 miles, then you just have to gut out the last 1.2 miles or so - which is easy when the finish line is in sight. I've gone to watch the Marathon other years including when my sister Vic has run it by herself, but that time - if I recall correctly - I didn't run around but just sat in one spot and saw her from there. With the advent of the Chicago Marathon mobile app and the ability to track runners by both split times AND an approximation with the map, it is pretty easy to find and connect with the runner(s) that you are there to support. I had a plan to see Nat in a few spots - focusing along Lake Street in the Loop and then down by where my parents always supported me: 26th and Wentworth. On Lake Street, we saw her at Lake/State (mile 1.5), Lake/LaSalle (mile 2.85) and Lake/Franklin (mile 13). I was joined by my Momma and our three kids for those stops. And Nat's family joined for the Franklin stop and beyond. 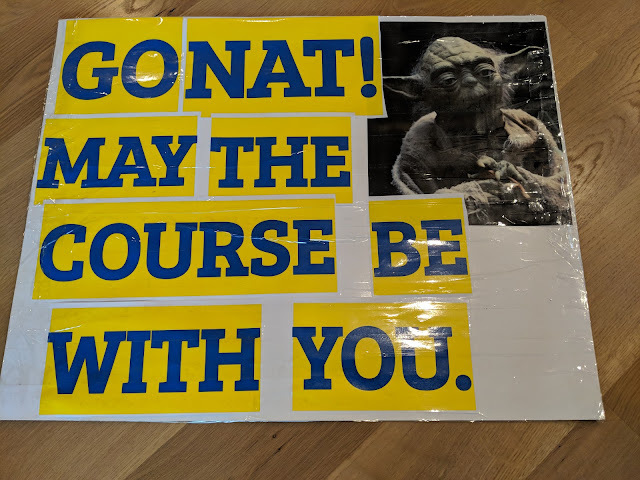 We all had signs that both supported Nat and were aimed at encouraging other runners to keep going. None of them are original. But all of them are funny. At least to me. 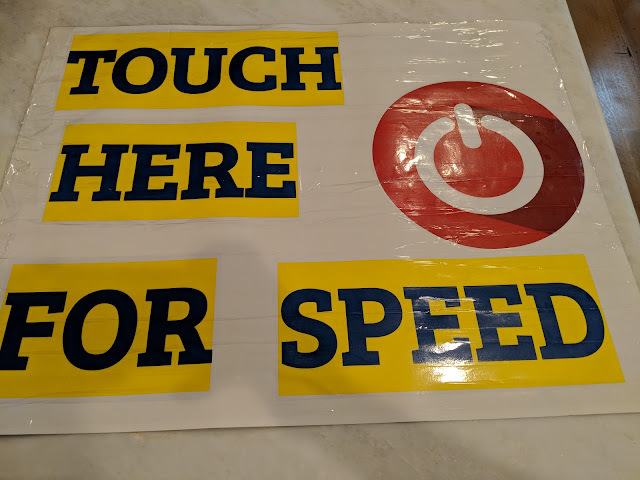 The one up top - "Touch here for speed" was the most fun - and the kids took turns holding it up. Star Wars - May the Course be with you - sign. 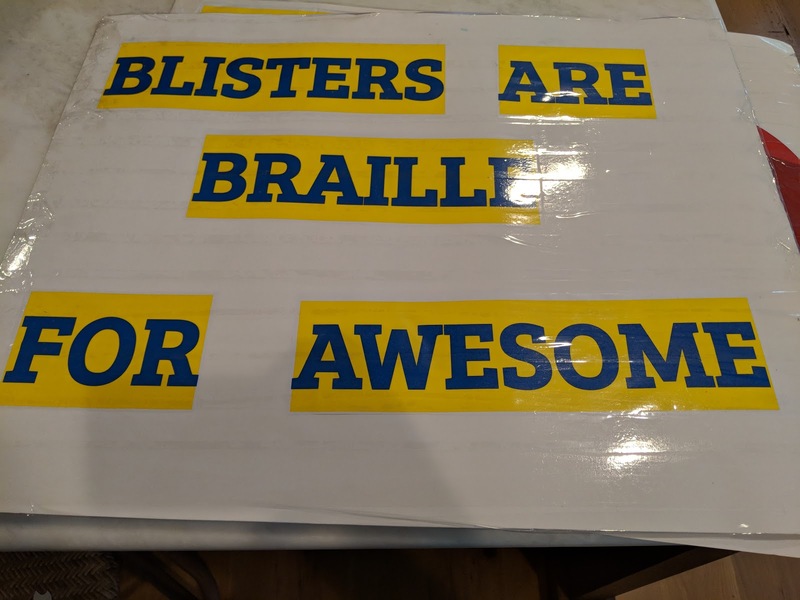 Blisters are Braille for awesome - encouragement/celebration sign for runners. 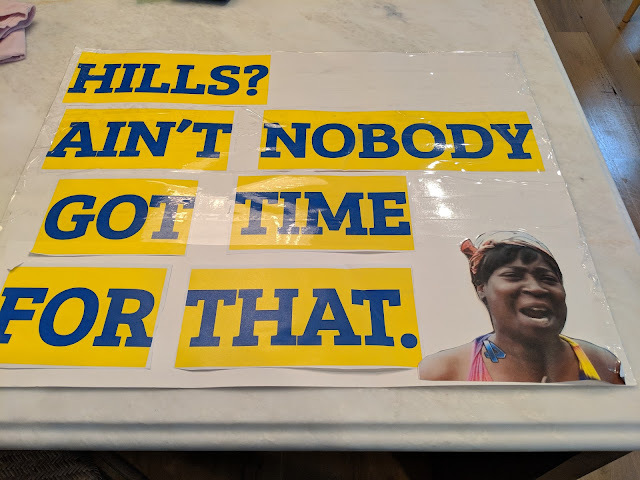 Using the Ain't nobody got time for that lady - for a sign about hills.